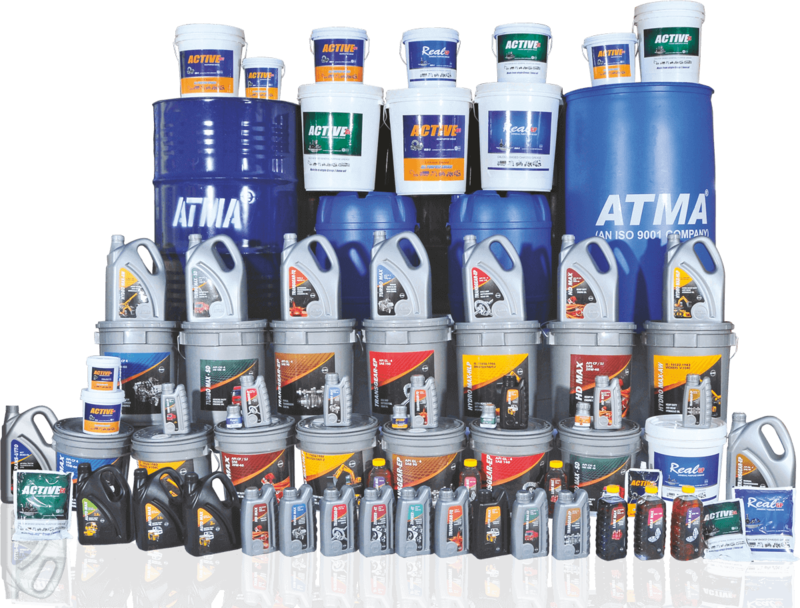 ATMA LUBRICANTS & SPECIALITIES LTD. is a professionally managed company established under the Companies Act (1 of 1956) in the year 1995. The company has started its commercial production and marketing operations in the year 1999 after establishing required infrastructure for processing and marketing of Automotive, Industrial Lubricants, Specialty Oils and Greases. The main objects of the Company on its incorporation are, to engage in the Business of Processing, Blending, Compounding, Testing, Packing, Repacking, Selling, Marketing, Exporting and Importing, Transporting of Lubricants and other related products like Brake fluids, Lubricating greases from Indigenous, imported base stocks and other raw materials, and to deal in lube base stocks, mineral oils, Synthetic Base Stocks, Additives, and other Special Products. The company has installed a capacity to process & blend 4,500 kl Lubricants per year (1,500 kl per year in a single shift) and to manufacture 1800 tones of Grease per year (600 tones per year in a single shift), And Diesel Exhaust Fluid (DEF) 2700 Tonnes per year (900 tonnes per year in a single Shift) and other testing facilities for processing and blending of various Lubricant Base Stocks and process oils with chemicals and additives to produce Automotive, Industrial Lubricants and Special Oils & Greases to meet the National / International / Customer established specifications to achieve customer satisfaction and to cater the lubricants requirements of Replacement Market, Fleet Owners, Institutions, Road Transport Organizations, OEM’s, Corporations and other Small, Medium and Large Scale Sector / Industries in Mumbai and Southern States of India. The company has started its commercial production and marketing operations in the month of May 1999. Presently, the company is concentrating to meet the requirements of the replacement market in the State of Andhra Pradesh & Telangana by appointing area wise Re Distribution Stockiest. , Direct sales/marketing to industries/ institutions and consignment agents. The company is in the process of establishing Sales / Marketing strategies to cater the requirements in Tamilnadu, Karnataka, Kerala, Orissa and Maharashtra states to achieve 100% capacity utilization through appointing Dealers/ Stockiest/ Distributors/ Agents. The company has established infrastructure facilities in such a way to double its capacity i.e., 9000 kl. Of lubricants per year (3000 kl. per year, 1200 tones of grease in a single shift) in the same premises. The registered office and factory of the company is located at Plot No. 169 &170, 54-5- 41, 5th road, Autonagar, Vijayawada - 520 007, Andhra Pradesh, India. 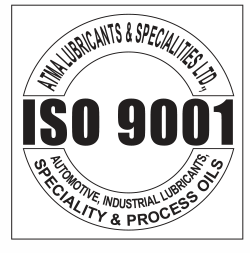 ”TO BE ONE OF THE LEADERS IN LUBRICANTS AND SPECIALITY OILS PROCESSING INDUSTRY IN SMALL SCALE SECTOR IN INDIA"
ATMA LUBRICANTS & SPECIALITIES LTD., is established to cater Lubricating and Specialty oil requirements of the Industry through Processing, Blending, Testing, Marketing and after Sales Service by complying to National, International and User defined Standards. We, the employees & Business Associates of ALSL shall endeavor to achieve customer satisfaction by continual improvement in Quality, Productivity, Delivery, Cost Reduction and after Sales Service in line with the growing expectations of customers. We shall also strive to achieve planned objectives and targets of the Organization and improve our Systems, Practices and Business performance. We shall be committed to comply with the requirements of international standard on quality management system and continually improve its effectiveness in its true spirits through total employee involvement. "Marketing, Processing, Blending and Testing of Automotive, Industrial Lubricants, Speciality, Process Oils and Manufacturing of Greases". Direct procurement of LOBS & Other Base Oils from refineries and importers. Direct procurement of Additives and Chemicals from reputed manufactures. Meticulous Incoming, In process and Final inspection for consistent Quality. In-House testing facilities for all Important and critical physiochemical characteristics of Lubricants, Specialty Oils & Greases. Testing as per IS/ASTM/IP/DIN methods with calibrated equipment / devices / gauges / Reagents. Manufacture as per API/DIN/BIS/ACEA/OEM/DEFENCE/User Specifications. Superior Technical & Quality Assurance Professionals. Approved Vendor with APSRTC, BHPV, and SINGARENI. 50 Standard products with continued additions with in house research & product development. Automotive Lubricants -500ml. 900Ml, 1Ltr, 2.5Ltr, 3Ltr, 3.5Ltr, 5ltr, 7.5Ltr, 10ltr, 20ltr, 50ltr, 210Ltr. Greases -100gms, 200gms, 500gms, 1KG, 2Kg, 3Kg, 5Kg, 10Kg, 20Kg & 180Kg. Industrial Lubricants -20 Ltr, 50Ltr and 210Ltr. All Automotive & Industrial Lubricants are processed from High Viscosity Index Group l Base stocks. Premium quality Engine oils and Hydraulic oils are processed from Group ll Base stocks. Performance additive packages are blended to improve the quality of the lubricants to perform well in actual operating conditions to enhance lubricant and equipment life. Auto Engine lubricants ranging from SAE 10W - SAE60 in Mono & Multi Viscosity grades. Auto Gear Lubricants ranging from SAE 75 - SAE 250 in Mono & Multi Viscosity grades. Industrial lubricants ranging from ISO VG2 – ISO VG 1500. Greases from NLGI -0 to NLGI – 3 Grade consistencies. Specialty & Process oils as per standard / user specification. Capacity to blend Lubricants 4500 kl and Greases 600Tonnes p.a. Infrastructure availability to enhance capacity to 9000kl lubricants and 1200 tonnes of Greases p.a. Good track record in adhering to blending & packing schedule. Quantities / volumes are assured @29.5°c by taking volume corrections at actual filling temperature.